Palladium is a noble metal and part of the Platinum group of metals. It was discovered in 1803 and was named after the astroid Pallas. Being a noble metal, the colour that you see is the metal colour throughout with no plating required, like in the case of white gold. Palladium’s low density makes a jewellery item weigh lighter than Platinum jewellery, lowering the cost to manufacturer and consumer alike. Palladium is also hyper-allergenic and will not cause skin rashes or discomfort any person prone to allergies. The use of Palladium is jewellery manufacturing dates back to 1938, where the alternative white metal was explored to replace its more expensive sibling, Platinum. Today Palladium is a recognised precious metal and used for making jewellery, predominantly engagement rings and men’s wedding bands. Its white-greenish lustre is modern, contemporary and sought after by many new consumers around the world. With many of the same benefits as Platinum, but at much more affordable prices, Palladium jewellery is fast becoming popular. Other uses for Palladium are in electronics and the car industry as a catalyst converter of emission gas into a lesser harmful gas. Palladium can be found mainly in South Africa, Russia and Montana in the USA. The most popular and best alloy for jewellery usage is 95% purity which makes the jewellery pure and durable at the same time. 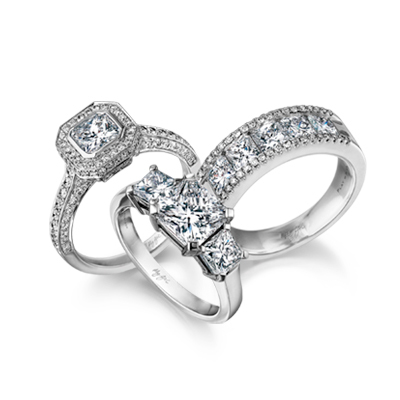 Any jewellery design that is possible with Platinum is also possible using Palladium, from hand-crafted jewellery making to machine casting and production work. Palladium will continue to grow in popularity with time.